Choose a Nomination necklace: each collection has its own personality and unmistakably unique style. 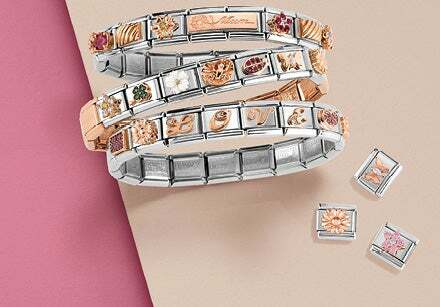 They’re crafted with only top quality materials according to the goldsmith artisan traditions that are emblematic of Made in Italy: stainless steel, gold, rose gold, sterling silver, and gemstones. This is why Nomination necklaces have become the perfect accessory to wear on any occasion, instantly adding an elegant and personal touch to every look. There are an infinite number of options for women: from long, delicate strands adorned with Cubic Zirconia, to short necklaces like those enhanced with the timeless elegance of pearls. There are plenty of collections for him, too: Metropolitan, Montecarlo and Steelikons offer a series of men’s necklaces appropriate for every occasion. From the essential stainless steel chain necklace to those with pendants, symbols, emblems and plaques, at times embellished with brilliant Cubic Zirconia details. Many men’s necklaces can be personalised with an engraving on the back side of the pendant. Discover all of Nomination’s necklaces for men, women and children. Classic yet current, yellow gold is used to create many of Nomination’s necklaces. Among the selection of women’s necklaces in gold you’re sure to find the one best suited to your personality and look, but you’ll also find the perfect gift for a special woman. Do you prefer a contemporary rigid collar necklace or a dangle necklace with a glamorous pendant? The amount of yellow gold Nomination jewellery is extensive and includes necklaces with pearls, with charming bow-shaped pendants, and details in sparkling Cubic Zirconia. There’s a beautiful gold necklace for every woman! For a casual yet chic look, go with a pendant necklace: there are so many to choose from and include long and short necklaces adorned with pendants of all shapes and sizes. From the most romantic, with large heart-shaped pendants for a true dreamer, to those with small, delicate charms that shine brightly thanks to multifaceted Cubic Zirconia. Among the offering of Nomination necklaces you’ll also find perfect necklaces for kids crafted in stainless steel, silver, and yellow and rose gold: check out the vast selection of children’s pendants, which include good luck symbols, darling animals like cats and dogs, hearts, angels and crosses, which are perfect as First Communion or confirmation gifts. Among Nomination necklaces you’ll find lots of jewellery for every occasion just for you or as a gift for someone you love, with a vast selection of necklaces under €100. Choose from the many long and short necklaces, with or without pendants, for a gift that’ll knock their socks off: romantic pendants, animals, good luck symbols, stainless steel plaques and so on. For a special, personalised piece, there are the MyBonBons necklaces. It’s an original way to show someone just how well you know them with a message or symbol that represents who they are, or you can simply surprise them with their initials or zodiac sign.